I hope you are all having a super fun day with your friends and family! I am too – but I wanted to let you know about a really fun sale going on for one of my favorite new things. But first look! I knitted something! Sort of! I will confess, I cannot knit. I can crochet all day long, but two needles completely baffle me. But I have found something that I just love to do and it is soooo easy! Have you tried loom knitting before? 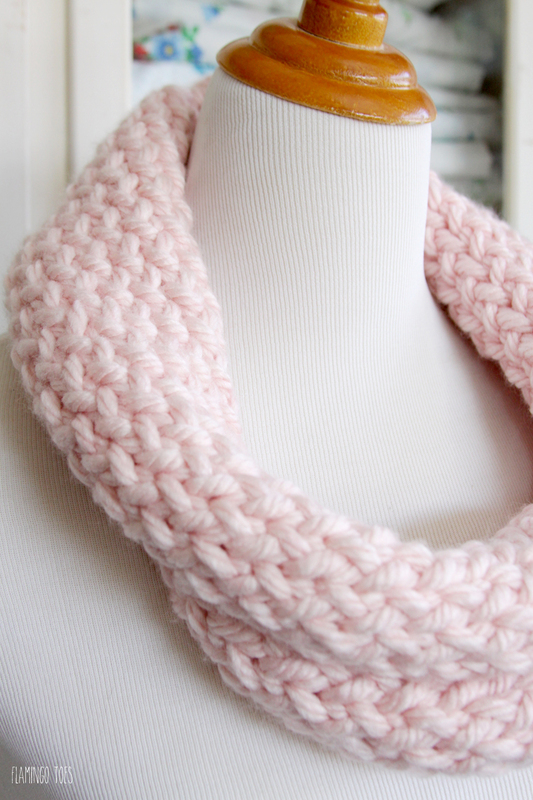 I made this super cute new scarf on a knitting loom! And believe me, if I can do this, anyone can. It’s so easy. I used this awesome Boye Loom Knitting Kit. It has so many different looms – you can make hats, scarves, slippers, purses, flowers and more! 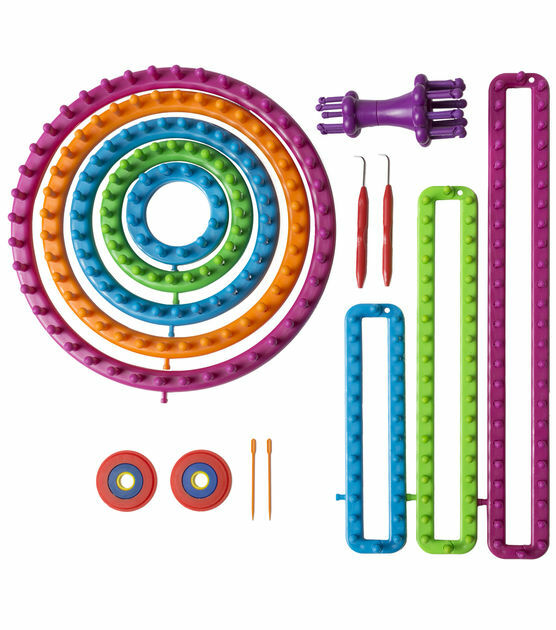 The kit comes with 15 pieces, including an instruction book with a bunch of cute projects. So this is normally $75 if you buy all these things separately, but right now through the 27th of November you can get the kit for 24.99 at Jo-Ann! I bought one for my niece too – I think she’ll love it! For this scarf, I used the blue round loom and used 20 of the pegs. 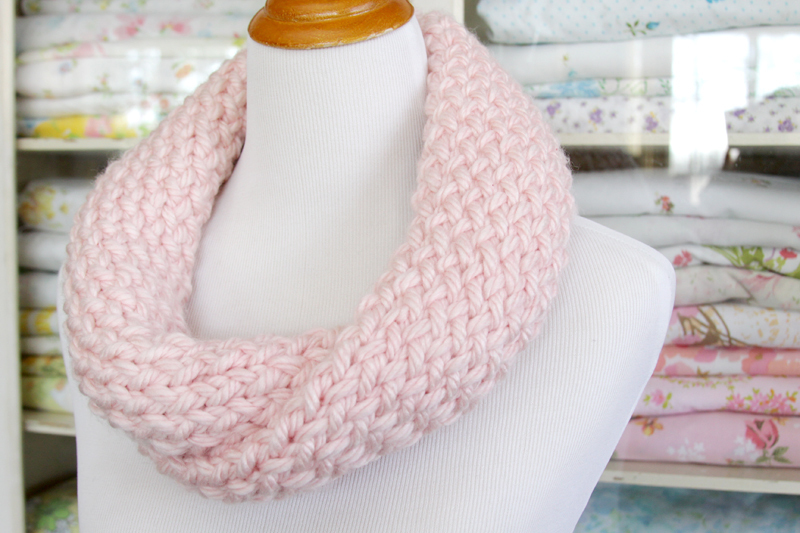 I used the flat method in the instruction book to knit the scarf. 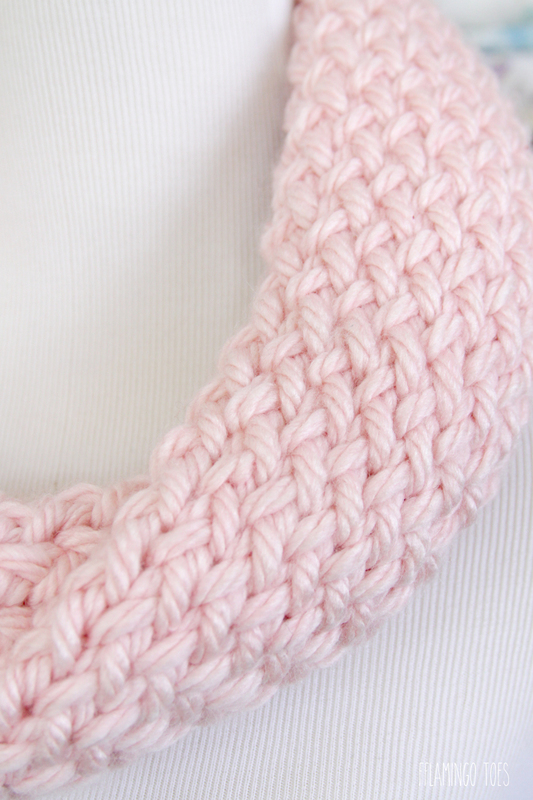 Once the scarf was about 32″, I finished it off, again with the instructions in the book. 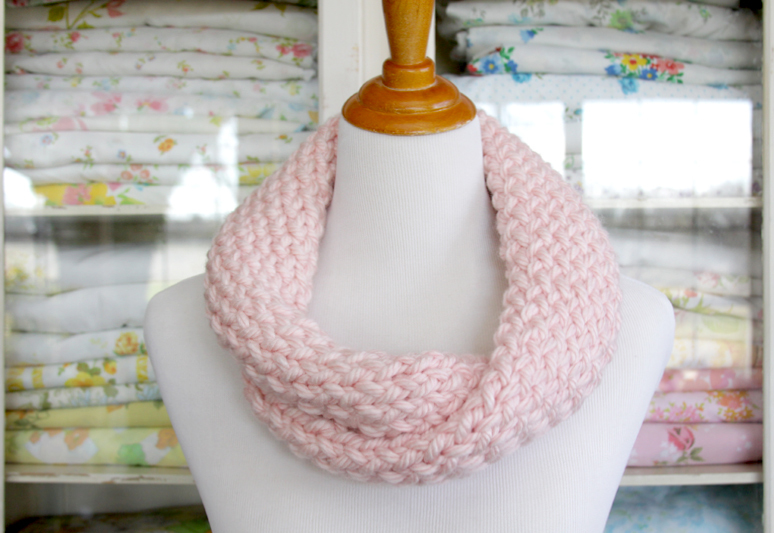 I twisted the scarf once, then used the end of the yarn to “sew” the two ends together to form the infinity scarf. I love how it turned out! I think I’ll make a hat next! 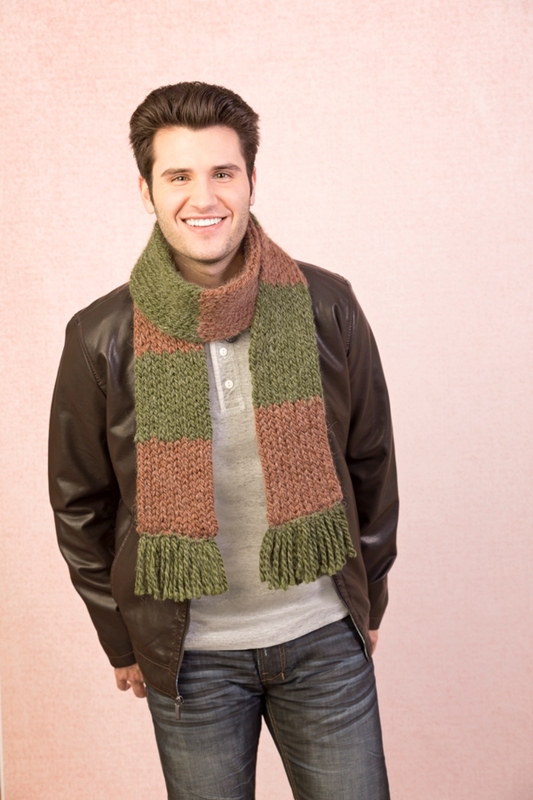 I have a free scarf pattern for you too – it’s perfect for a guy or a girl – a great basic striped scarf! Don’t forget to check out Jo-Ann for the deal, the kit is only on sale through November 27! 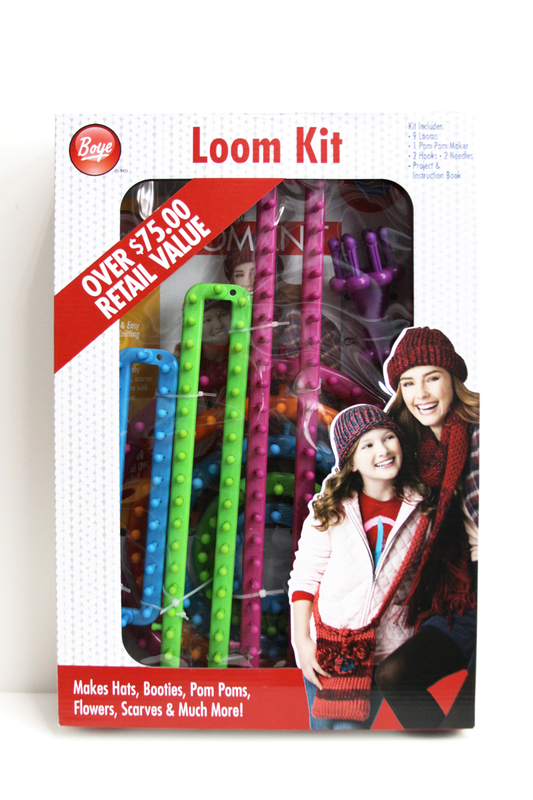 Have you tried a loom project yet? I’d love to hear what you made! It’s beautiful! I love the color and the chunky yarn. What kind did you use? I would love to make one. I have made hats and a long scarf on the Knifty Knitter. I will have to try making the cowl. Hi Judy! It was Red Heart Grande in Nectar. I got it at Jo-Ann! This scarf is lovely. What brand and weight (and color) of yarn did you use? It’s exactly what I’ve been looking for! Thank you. And happy Thanksgiving!! Thanks Lynette! The yarn is Red Heart Grande in Nectar. I found it at Jo-Ann. 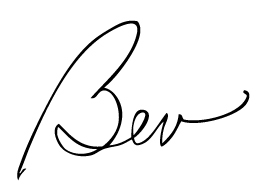 Hi again, Bev! I bought the yarn and the loom set (yay!) but don’t see the pattern you used in the book that came with the loom. Can you direct me to the pattern? Yay Lynette that’s awesome! Sorry about the instructions, I should have been more clear. I used the blue round loom and used 20 pegs but a flat loom will work too. The round was just easier for new to hold. I used the Slipped Stitch Edge method on page 11 and the Flat Panel Bind off on page 12. I hope that helps but let me know if you have any more questions! THANK YOU so much for replying with exact instructions so quickly!! I’ve made a pink cowl for my daughter and now I’m making a black one for my sister who was oohing and aahing over the pink one. I own the round looms and have some chunky yarn. I am probably going to make that soon! I do actually have a preference of knitting looms. The Boye ones have little hooks at the end of each peg. Sometimes, the yarn catches onto it and it takes the fibers apart. I prefer the Knit-Quick knitting looms. Instead of hooks, they have knobs, yet they still have the grooves. It amuses me that you cannot knit. My mother, grandmother, sister, and I knit AND crochet, so I’m not really used to people only being able to do only one (Yes, it’s naïve, but it’s me!). Thanks for the idea/pattern, Bev! So much fun, especially for kids or those afraid to knit! thanks for sharing on craft schooling sunday! 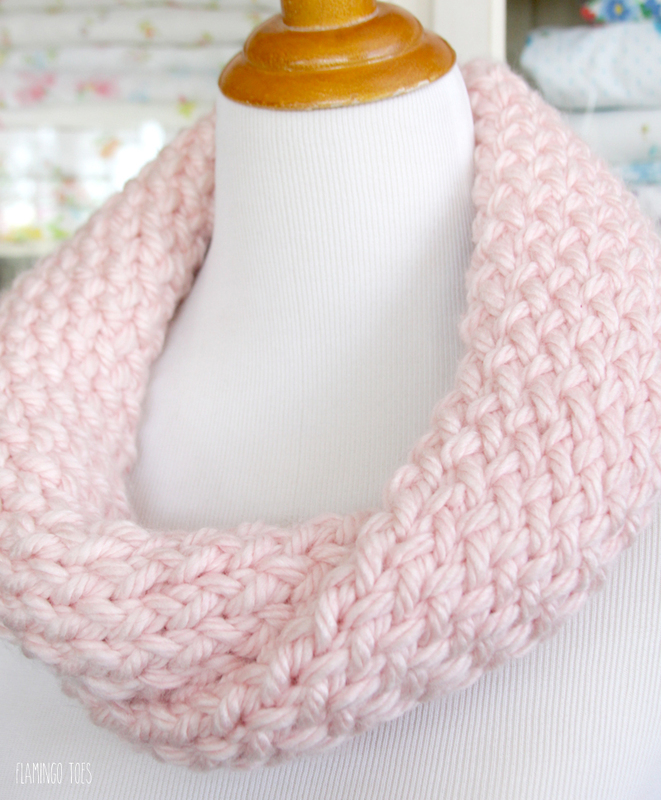 Your cowl turned out great – love the shade of pink. I have not tried to loom knit but I do knit a lot with regular knitting needles. Same here. Although I do enjoy loom knitting. 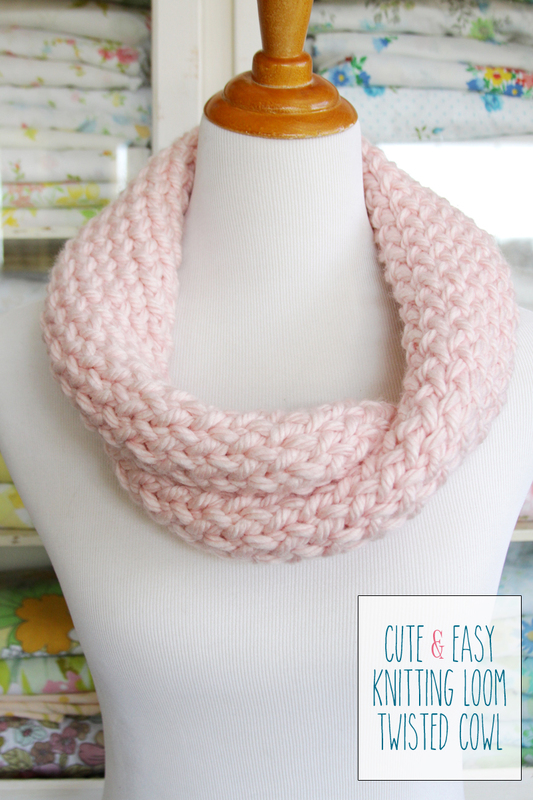 I’m sorry but where is the pattern for this Very Pretty Cute & Easy Knitting Loom Cowl? Where do I go to get the pattern?